I took a chance on Rendezvous in Venice – I’d heard very little about it, but all the signs were good. The wistful cover image caught my eye when one of my favourite bookish tweeters bought the novel and posted a photo on Twitter. I loved the title with its hint of a secret meeting between lovers and Venice setting (who can resist a novel set in Venice?). It’s published by Pushkin Press, a trusted and reliable source of literature. I seem to do well with their novels, so I snapped it up. Luckily it turned out to be an absolute gem – it’s a beautifully nuanced story and a delight from start to finish. The notebook reveals details of a deep and passionate affair between Charles and Judith, a short-lived but intense romance that appears to have taken place some 25 years ago when Charles was in middle age. This revelation comes as a complete surprise to Pierre as he cannot imagine his uncle in a close relationship with a younger woman. Women were not absent from his uncle’s thoughts, Charles loved them, but they were always women in paintings – Bronzino’s Eleanor of Toledo, for instance. Rendezvous is a short novel, and the story is so delicate that I’d like to allow readers to discover it for themselves. Save to say as the narrative unravels, Pierre is left wondering just how well he knew his uncle, this man who seemed so focused on technique, the brushstrokes and layering of colours on the canvas. Instead, I’d like to mention a few other points about Rendezvous. Alongside the intriguing storyline, this novel also offers a wonderful meditation on art. It contains reflections on a number of Italian Renaissance artists and their paintings, including Botticelli’s Primavera and Piero di Cosimo’s portrait of Simonetta, which resides in Chantilly, France. There are references to novels and the appearance of art in literature, too. In a beautiful scene from Rendezvous, Pierre recalls Charles discussing the passage in Anna Karenina when Konstantin Levin meets Anna for the first time. Levin has never seen Anna; he only knows what people say about her. While he is waiting for Anna to appear, Levin sees her portrait and is overcome by her image. It is Charles’ belief that Tolstoy offers his readers one of the deepest and most profound insights into the art of painting: the potential to see what is ‘between’ the artist and their subject. As you’ve probably guessed by now, I rather loved Rendezvous in Venice. It’s an elegant story, delightfully subtle and full of ravishing images. There is a timeless quality to the narrative as if Charles and Judith’s affair could have taken place thirty years ago or fifty years earlier. The writing is exquisite; it’s a joy to read. This is a must for any lover of Renaissance art and Venice. As one might expect, this novel is also a wonderful evocation of Venice. At times, it feels as if the reader is roaming the streets of the city with these characters. I’ll finish with a favourite quote, one that captures the beauty of the writing as Pierre recalls walking with his uncle in the evening light. Rendezvous in Venice (tr. by Paul Buck and Catherine Petit) is published in the UK by Pushkin Press. Source: personal copy. This entry was posted in Beaussant Philippe, Book Reviews and tagged #TranslationThurs, Book Review, Catherine Petit, Fiction, France, Literature in Translation, Paul Buck, Philippe Beaussant, Pushkin Press on May 26, 2015 by JacquiWine. Sounds wonderful. My favourite indie store has a small press section and invariably all of the Pushkin books look and sound amazing. I will have to make a note of this one, sounds like an ideal for when I desire a change of mood/pace. It is such an exquisite little book in every sense. The story itself is absolutely charming. I would love to say a little more about it, but it’s such a brief novel and to reveal anything else might spoil the surprises to come! Enjoyed this piece, Jacqui, thanks. Sounds worth a look. I’m reading John Harvey’s new book ‘Poetics of Sight’ at the moment, which is largely about the relationships between painting (art) and literature, so this novel sounds highly appropriate. Don’t think he’s mentioned it so far. Will review it on my blog at some point, time permitting. Hadn’t heard of Beaussant: is it a contemporary novel? Thanks, Simon. I think it’s a delightful little novel. It was originally published in French in 2003, but it has the feel of a much older novel. There’s a beautiful, timeless quality to the story almost as if it could have taken place at any point in the second half of the 20th century. I’m not familiar the Harvey you’ve mentioned, but I am interested in the whole relationship between art and literature. I’ll definitely keep an eye out for your review. On a similar theme, have you read Ali Smith’s How to be both, another book that features art (frescoes in this case) as part of the narrative? It’s such a playful novel full of ideas and connections between the two intertwining threads. I liked it very much. No, though I loved Artless & her short stories. I’m interested in this notion of ekbasis- writing inspired by a work of art. Harvey’s book is concerned with ‘visual metaphor’. It’s on the TBB pile: To Be Blogged! Glad to hear you enjoyed Artful as I’d like to read that one. I love the way she plays with form – it’s a blend of essays and fiction, as far as I can tell. Another one for wishlist – have to say you have really broadened up my reading horizons since joining Twitter… thank you! You’re very welcome, Poppy. I really loved this one, and it would make a perfect gift for anyone interested in art and the stories captured by paintings. It came just at the right time for me, the perfect antidote to all those tales of tortured marriages I’ve been reading lately! This sounds lovely, Jacqui. Definitely one for the list. Thanks so much for the recommendation. You’re very welcome, Susan. It is a real gem. I think you’d like it very much – Beaussant’s style is exquisite. I enjoy it when literature involves and explores visuals art. I find that literature and other art forms compliment each other very well. Venice could not be a better setting for such themes. Yes, me too. There must be a genre of novels featuring the relationship between literature and art – I can think of quite a few off the top of my head. Venice is the perfect setting for this story; I’m almost tempted to book a weekend break in the Veneto region right now! Oh, how I envy your language skills! I would love to be able to read this novel in French. It’s a very subtle story, and the translators must have done a great job as the prose is so elegant. I love reading reviews on books I’ve read – you have pulled out such different aspects of it to me but they’re great ones. Wasn’t that passage about Little Girl with Dead Bird wonderful? The whole book made me want to know so much more about art. And go to Venice. I’ll be reading this again. Thanks, Audrey. It’s so interesting to compare notes, isn’t it! I’ve just read your review, and you’ve captured the novel very well. The story behind the Little Girl with the Dead Girl was one of the highlights for me, almost like a mini-narrative within the novel. Isn’t it funny how we can imagine a person’s life — their backstory and situation — just from studying a painting? I’d like to revisit this one too, and it’s certainly brief enough to warrant a second reading. Thanks, Karen. I’m going to stick my neck out here and say I’m fairly confident you will enjoy this one! It might leave you with a few questions and a desire to know more about one or two of the characters, but there’s so much to enjoy. It’s almost getting to the stage where I’ll buy these Pushkin Collections novels without a second thought…they’re just so reliable. I’m pretty much the same – I don’t think I’ve had a Pushkin that let me down yet! This sounds truly lovely. It has all the ingredinets that make me love a book as well. Puls it sounds melancholy. I loved it, Caroline. It’s on the wistful/nostalgic side of melancholy, and it suits the setting perfectly. I think you’d enjoy Beaussant’s prose style too. Jacqui, do you have a Pushkin subscription? I subscibed and now I wonder if I can find out which books I’ll be sent. I don’t I’m afraid. It might be worth emailing them to check? It’ll be a surprise then. I’ll be careful what I order from them. That might help not odering so much. What a lovely sounding novel. Pushkin Press books do look very attractive though I don’t think I have read any. This one would make a very good introduction to Pushkin. It’s a charming little story. This one is on my TBR pile! Looking forward to reading if after your lovely review! Oh, great! I’ll be curious to see what you make of it, Melissa. I’ll keep an eye out for your review. Think I’d really like this one, thanks Jacqui. Pushkin Press is always a plus in my mind. Pushkin Press are pretty reliable, aren’t they? I’ve yet to be disappointed by one of their books, especially those in the Pushkin Collection. There’s something rather wistful about this one. I’d never heard of this author before. I’m hoping Emma might drop by as I wonder whether she might be familiar with his work. I visited Venice once, quite some time ago, and it would be wonderful to “roam the streets of the city” again. This sounds like a perfect book for when I am looking for something quiet and introspective. It’s been a while since I visited too, but I’d love to go back – Verona is another favourite. And I love the wines of the Veneto region, so it’s the perfect setting for me. Introspective is a good way of describing this one; it’s rather lovely and thoughtful. A timely chance of pace for me after some of the women-on-the-edge stories I’ve been reading lately! I love the idea of building stories around paintings – adding this to my list! Yes, me too. It’s one of the things I loved about this book. I can spend ages gazing at paintings imagining the lives and backstories of the figures they capture. Rendezvous is a lovely little novel if you’re looking for a change of tone, something charming and wistful. This sounds like another wonderful find from Pushkin. I hadn’t realised it was a contemporary book – perhaps it was the mention of Venice that made it seem older. It is. (How do they manage to unearth these gems?!) At first I thought it was an older book too, partly because several of the Pushkin Collection novels I’ve read were written in the first half of the 20th century. And there’s something very nostalgic about the story in Rendezvous – it’s timeless in a way. This sounds charming. I love the Pushkin Press editions, they are so toothsome. I don’t dare add any more books to my toppling TBR at the moment, but I’ll have to bear this in mind for another time. I can imagine how the spare, exquisite writing must read in French – brings Maupassant to mind for me, a writer whose style in short stories I love. Oh, I know that feeling about the TBR, and I suspect you have so many books crying out for attention especially with your SNB commitments! 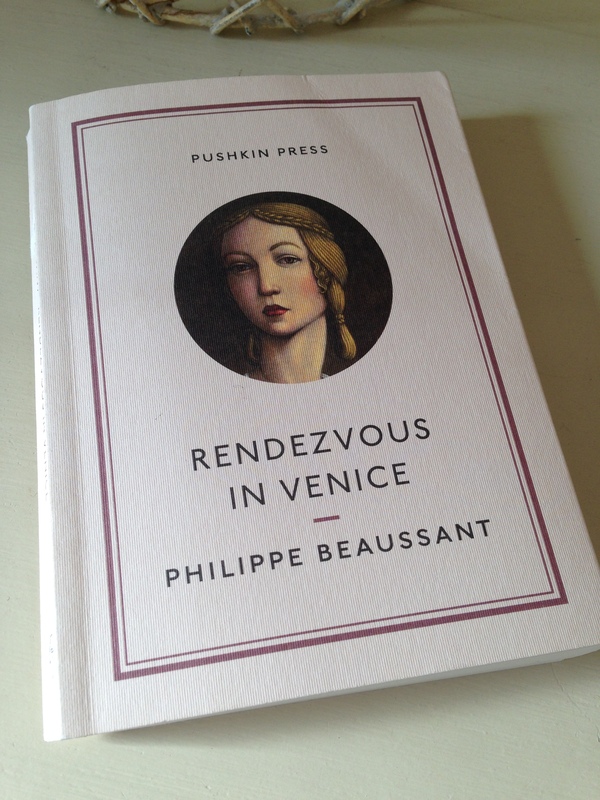 Rendezvous is rather lovely, ideal if you fancy a vicarious trip to Venice one day. It’s funny you should mention Maupassant as he’s on my list of writers to try. Delighted to hear you are a fan of his short stories – I’m sure I’d enjoy them too! I love Venice, though our (me and my wife) last trip there was so good we probably won’t go again for a while. When I do I may try and take this. It sounds a good companion to actually being there. It is a most melancholic city in some ways, which makes it sound here like the mood of the book reflects the subject. The description of uncle Charles and Pierre’s relationship reminded me of In Search of Lost Time, first volume, Swann’s Way. Indeed, in this volume, Charles Swann loves art, paintings in particular. He falls for Odette because she reminds him of a painting from the Renaissance era. There are also a lot of descriptions of Venice, as the Narrator wishes to visit the city. I wonder if there’s a hidden reference to Proust in this novella. I’ll have to read it to make up my mind. I’ve never read Proust (yes, I know), but it wouldn’t surprise me. Rendezvous contain references to various others works (artistic and literary) – several paintings are mentioned, plus Anna Karenina, so there may well be a nod to Proust, too. I think you’d enjoy this one, Emma. In fact, I was wondering whether you might have read it already. I hadn’t come across Beaussant before, but his prose is exquisite. Nice thought Emma, I hope you do read it as I’d love to see that angle explored. I’ll second that – a very timely observation in light of your Proust posts.